Introducing myself, DJ Little A, the voice you’ve been hearing every Tuesday morning from 10:00am – noon! Helping you start your day by playing the hottest tracks from today, throwing it back with the freshest throwbacks, and keeping you informed and entertained as best as I can. My weekly segment is a joke of the day which takes place at the halfway point of my show at 11:00am. Why aren’t koalas classified as bears? … Because they don’t have the right koalafications! About myself, I’m Italian, a fourth year student majoring in Kinesiology, I’m on Laurier’s Emergency Response Team, I’m a big fan of dogs, long walks on the beach, the colour blue, and all things Maple Leafs and Blue Jays related. 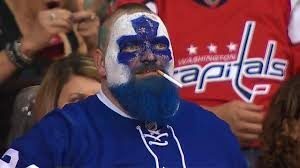 Jason Maslakow, Dart Guy, brought good luck to team showing his passion by attending all the games in that series and painting his face and beard for each one. In a recent article, Jason told the Toronto Sun that he has called it quits to smoking, a habit he picked up at 16 years of age. Good on you Jason! Hoping everyone had a safe and relaxing reading week spending time with family and friends. I spent the majority of mine in a Library preparing for the work filled week back from reading week. I can imagine everyone ate as much as they can during Thanksgiving. Being Italian, my grandparents went all out cooking enough food for an entire village. Other Italians out there, I know you probably had a similar Thanksgiving experience. Be sure to tune in next week where I’ll have my first ever featured guest! Matthew Downs, Coordinator of Laurier’s Emergency Response Team agreed to come on my show and tell you what we do and why you should consider joining!